Heat oven to 350°F. Spray 13x9-inch (3-quart) baking dish with cooking spray. 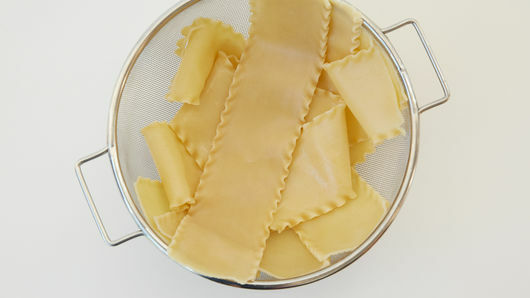 Cook and drain lasagna noodles as directed on package. Reserve 2 tablespoons crumbled bacon for topping after baking. Meanwhile, in 2-quart saucepan, melt butter over medium heat. Add garlic; cook about 1 minute, stirring occasionally, until golden. Stir in flour, salt and pepper; cook until thickened. Stir in whipping cream and broth; heat to boiling, stirring constantly. Boil and stir 1 minute. 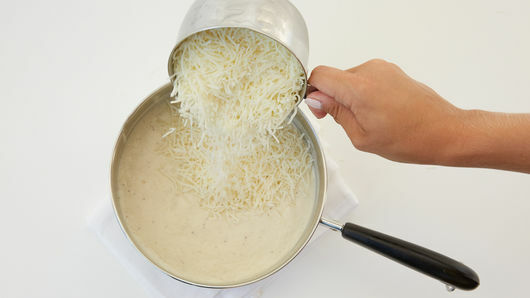 Stir in 1 cup of the cheese. Remove from heat. 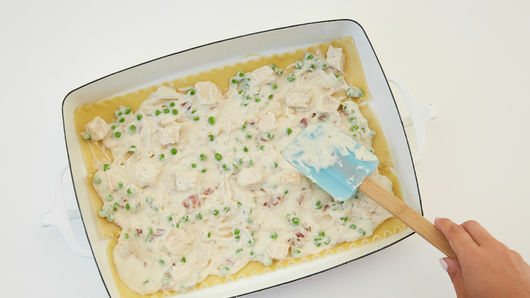 Spoon and spread 1/2 cup sauce in bottom of baking dish; top with 3 noodles. 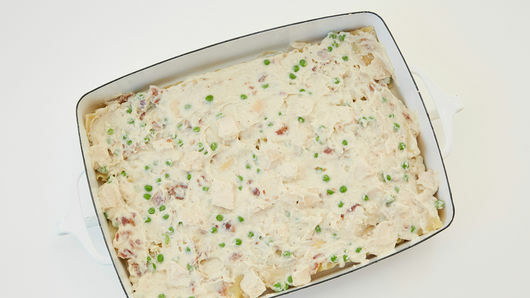 Add chicken, remaining crumbled bacon and frozen peas to remaining sauce in saucepan. 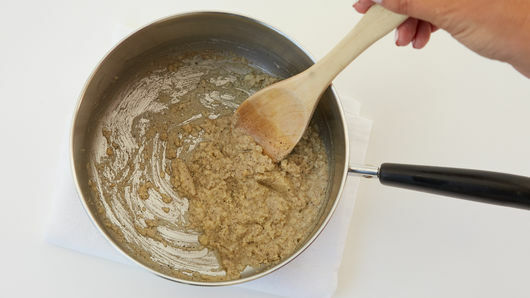 Spread one-third of the sauce mixture (slightly less than 2 cups) over noodles. Top with 3 noodles. Repeat with one-third of the sauce mixture and remaining 3 noodles. Top with remaining sauce mixture. Cover with foil. 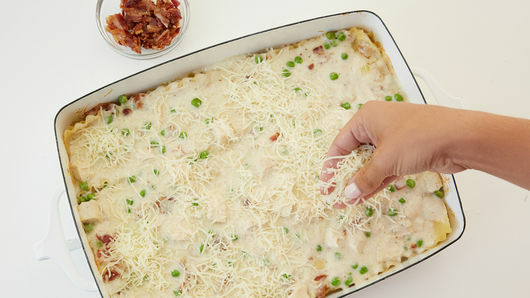 Bake 35 minutes; uncover, and sprinkle with remaining 1 cup cheese and reserved bacon. Bake 8 to 10 minutes longer or until heated through and cheese is melted. Let stand 15 minutes before cutting. Sprinkle with chopped basil. 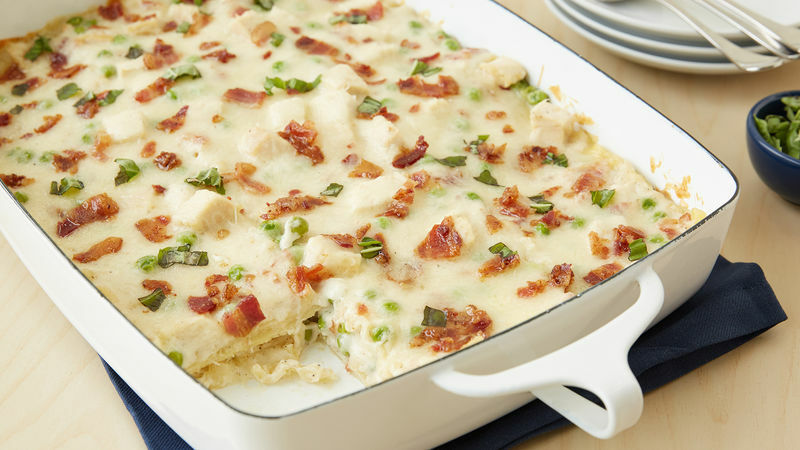 For convenience, use cooked rotisserie chicken and precooked bacon. 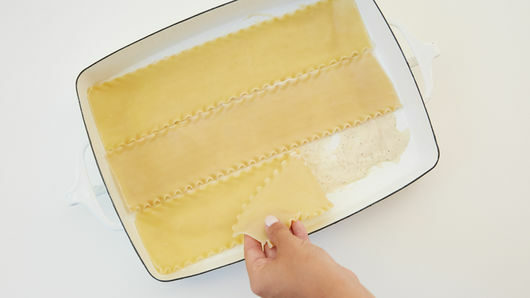 Make lasagna ahead; cover and refrigerate. Add additional bake time, making sure casserole is heated through in center.